The Tomato and Basil Risotto is a natural product made without preservatives and without additives. 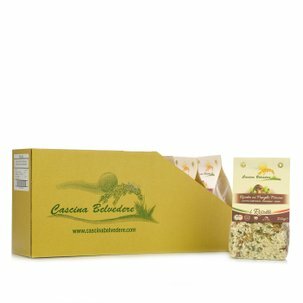 As with all Cascina Belvedere risottos, also this product is prepared with respect for the traditional recipes, measuring the high quality ingredients to be combined with the best rice, which produces an exquisite and healthy dish that is above all easy and quick to prepare. The controlled atmosphere packaging also guarantees the unique freshness you will notice when you open it.